Five finalists for one of American racing's most prestigious honors, the Santa Anita George Woolf Memorial Jockey Award, have been announced. Following a vote of jockeys nationwide, the winner of the 2019 Woolf Award will be announced in late February. Jockeys Joe Bravo, Kerwin Clark, John R. Davila, Jr., Julien Leparoux and Scott Stevens are the finalists for the trophy that has been presented annually by Santa Anita since 1950. One of the most coveted trophies in all of racing, the Woolf Award, which can only be won once, is presented to a different jockey each year and it recognizes those riders whose careers and personal character earn esteem for the individual and the sport of Thoroughbred racing. The trophy is a replica of the life-sized statue of legendary jockey George Woolf, which adorns Santa Anita's Paddock Gardens area. Woolf, who died at the age of 35 following a spill on Santa Anita's Club House turn on Jan. 3, 1946, was regarded as one of the top big-money riders of his era. Known affectionately as “The Iceman,” he was revered by his fellow riders, members of the media and fans across America as a fierce competitor and consummate professional who was at his best when the stakes were high. The 2018 Woolf ballot, which will be distributed to active jockeys across the country, features five veteran riders who have plied their trade with honor and distinction. A dominant force in his native New Jersey since the early 1990s, “Jersey Joe” Bravo is Monmouth Park's all-time leading jockey, with 13 riding titles and has been leading rider at The Meadowlands nine times. Born on Sept. 10, 1971, Bravo first rode professionally at Calder Race Course in South Florida in the fall of 1988, at age 17. Bravo's dominance in New Jersey is no better underscored than by his success in the Jersey Shore Stakes at Monmouth, as he's won the race six times, including three straight beginning in 2004 and most recently, in 2017. 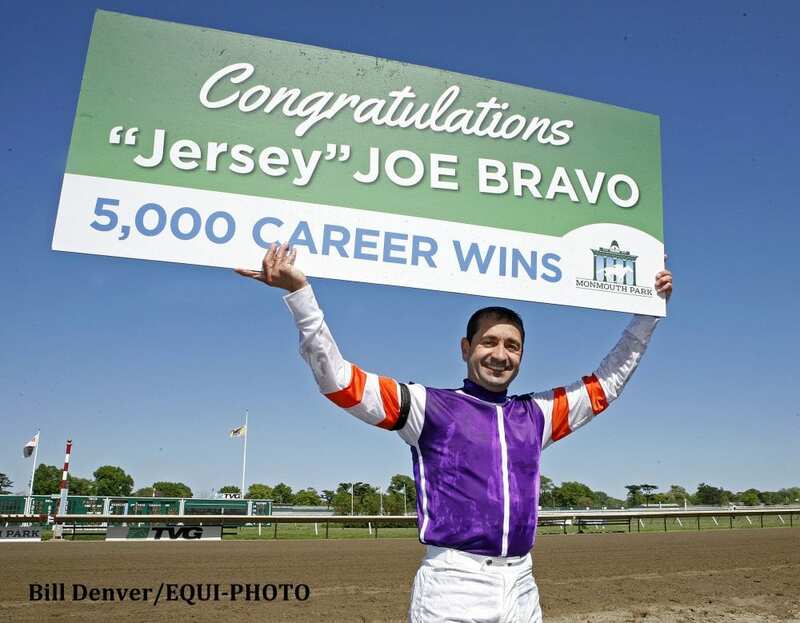 Perennially among America's leading money-won jockeys, Bravo won his 5,000th career race in May, 2015 at Monmouth, thus becoming only the 31st North American jockey to reach this lofty plateau. A Louisiana native who attained national acclaim by winning the 2015 Kentucky Oaks at the age of 56, Kerwin Clark has long been respected by fans, horsemen and his fellow jockeys as a rock-solid rider who has conducted himself with a quiet distinction for more than 42 years. Seriously injured as the result of a three-horse spill at Fair Grounds in New Orleans this past March 15, Clark is the son of a jockey who began riding at bush tracks at an early age and broke his maiden in New Orleans on Jan. 3, 1976. Although not well known on a national scale, John Davila, Jr. notched his 4,000th career win this past October 29th at Finger Lakes Casino & Racetrack near Buffalo N.Y., where he has plied his trade on a full-time basis since 1983. Still going strong at age 54, Davila, a Puerto Rican native, is Finger Lakes' all-time leading rider and has won a record 14 jockey titles there—including a streak of 11 in a row from 2001 through 2011. Another glaring indicator of just how dominant he's been at the track nestled half way between Buffalo and Syracuse is that only 47 of his 4,000 victories have come at other tracks. Second at the most recent Finger Lakes meeting which concluded Nov. 28, Davila and his wife, former jockey Elaine Castillo, winter in Puerto Rico. Regarded as one of the top riders in the world, French-born Julien Leparoux first immigrated to America in January 2003, when he went to work as an exercise rider for then Southern California-based trainer Patrick Biancone. Leparoux would go on to break his maiden on July 26, 2005, at Saratoga and reached uncharted heights in 2006 as America's Eclipse champion apprentice while leading all jockeys with an apprentice-record 406 wins and his $12.4 million in purse money-won that year ranked him 12th overall among all jockeys. A winner of seven Breeders' Cup races and an 11-time leading rider at Keeneland, Leparoux notched his second Eclipse Award in 2009, when he was named champion jockey at age 26. The son of a jockey-turned trainer, he married the late trainer Mike Mitchell's daughter Shea in December 2012. The Leparoux's have a 3-year-old son named Mitchell. Long held in the highest regard by his fellow riders, Scott Stevens continues to serve as a helpful, guiding light to jockeys everywhere at age 57. The older brother of recently retired Hall of Famer Gary Stevens, Scott is again a full-timer at Turf Paradise in Phoenix, Ariz., where he's a nine-time leading rider. An Idaho native, Stevens broke his maiden on May 30, 1976 at Le Bois Park in Boise. Tough as nails, he's overcome multiple life-threatening injuries while amassing more than 4,800 wins from more than 32,400 career mounts. A member of the Canterbury Park and Idaho Racing Halls of Fame, Scott Stevens is truly an iconic figure on the American racing landscape. For additional information on the Santa Anita George Woolf Memorial Jockey Award, please visit santaanita.com. This entry was posted in NL List, People and tagged George Woolf Memorial Jockey Award, joe bravo, john davila jr, julien leparoux, kerwin clark, scott stevens by Mike Willman/Santa Anita. Bookmark the permalink.